Nashville, Tennessee, January 25, 2010 – Following on the success of the first annual Nashville Recording Workshop + Expo in 2009, The AES Nashville Section and Mike Curb College of Entertainment & Music Business, in conjunction with the Audio Engineering Society, Inc. in NY are pleased to announce the dates for this year’s session to be held at The Curb Event Center at Belmont University, just steps away from the heart of Nashville’s legendary Music Row. This two-day conference and trade show exposition will be held on March 5-6, 2010, and will once again feature top industry guest speakers and panelists, as well as exhibits by many of today’s leading audio gear manufacturers. Last year, over 300 attendees from 28 states and 5 different countries participated in this unique industry event which focuses on recording musicians and engineers working in wide variety of personal production spaces and studio environments. Students from some 20 audio technology schools were also part of that number. 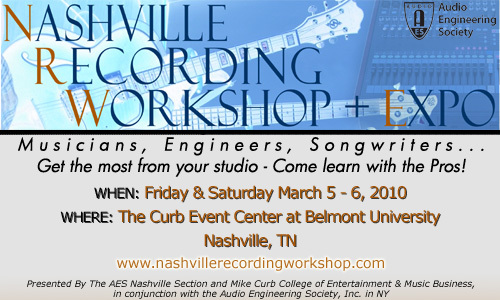 The Nashville Recording Workshop + Expo was designed to provide the growing number individuals owning personal recording spaces, including artists and songwriters, access to the experience and knowledge of the AES and its affiliates, and to provide real-world insights into technology and techniques that can help attendees achieve professional results, whether in a high-end recording studio or working with a less-than-professional budget. Last year’s presenters included an immense presentation of Nashville talent, from keynote address speaker Ricky Skaggs, to the dozens of leading industry professionals representing all genres of music, including: Rich Adler, Jeff Balding, Lynn Fuston, George Massenburg, Vance Powell, Michael Wagener and many more. Additional guest presenters included NY-based mastering engineer Alan Silverman and CA-based engineers Tony Shepperd and Jeff Markham. Sessions included topics such as Capturing Acoustic Instruments, Recording Vocals, The ABC’s of Mics and Preamps—a full slate of focused content with an emphasis on live demonstration. Names of this year’s presenters will soon be announced, with an equally impressive line-up of topics and talent. Beyond workshops, attendees could also browse the offerings of the sold-out ‘Expo’ portion of the conference, with gear, products and services demonstrated by over 50 hardware and software manufacturers and vendors (many offering special NRW+E discounts on their products), as well as professional organizations representing songwriters, musicians and engineers. For additional information on attending or exhibiting at the 2010 Nashville Recording Workshop + Expo or to view information and media from this year’s event, visit www.nashvillerecordingworkshop.com. Additional information on the Audio Engineering Society (AES) can be found at www.aes.org. Now in its 6th decade, the Audio Engineering Society was formed in 1948 by a group of concerned audio engineers. With over 14,000 members throughout the U.S., Latin America, Europe, Japan and the Far East, the AES serves as the pivotal force in the exchange and dissemination of technical information for the industry. For additional information visit http://www.aes.org.